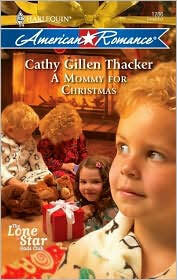 Cathy Gillen Thacker - Romance Novelist - What do we do when a child asks for something we just can't give? What do we do when a child asks for something we just can't give? Christmas inspires us all. There is something about the month of December that encourages people to give of their hearts, their time, and their money. For causes, big and small. And to the benefit of friends and family and the people in their lives that they love most of all. But what do we do when a child asks for something we just can’t give? Travis Carson is in that predicament. His daughters, four and a half year old Sophie, and three and a half year old Mia, want a mommy for Christmas, and they expect Santa to bring them one. Travis explains this isn’t possible. And because he wants his two little girls to be happy, begins looking for other ways to give them more of the feminine influence they need in their lives. His best friend and neighbor, Holly Dawson, does not have that problem. Her three and a half year old twin sons, Tucker and Tristan, have never really known the father that deserted them shortly after birth, and they don’t seem to particularly want a daddy, either. The problem is, their dad is suddenly interested in seeing them again. And Holly isn’t sure if this is a gift, or a calamity-in-the-making. Travis and Holly tackle these two problems the same way they approach every other challenge in their single-parent-families—together! And before they know it, the Christmas season is bringing them one very wonderful gift, too.